Sometimes corresponding events that might otherwise be considered mere coincidence are so amazing that they're attributed to serendipity or universal irony. This... isn't one of those times. But it might just make you go, "huh." Google's recent acquisition Nest Labs has launched the Nest Developers Program, which will allow developers to easily create connections between the smart thermostat and smoke detector hardware and other integrated devices. You can check out various tools and documentation at developer.nest.com. 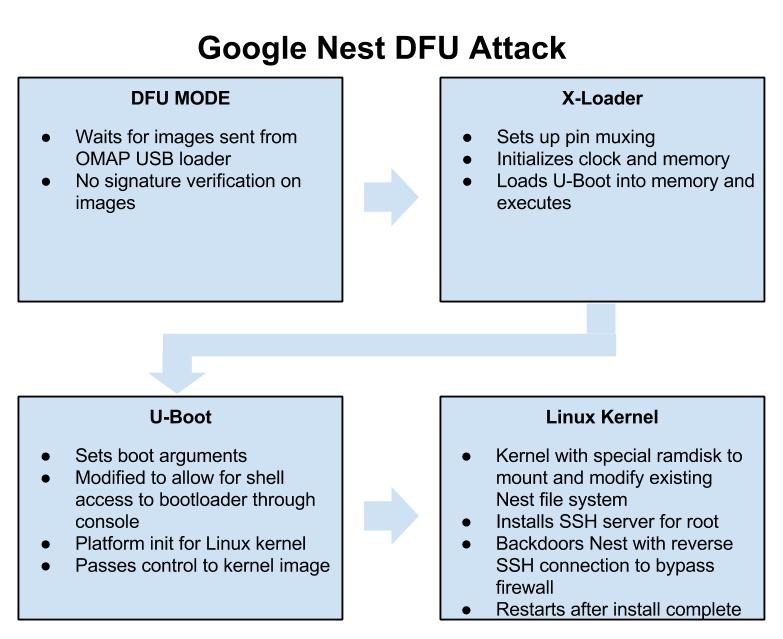 Also launching today is GTV Hacker's first extensive post on the Nest, which exposes some alarming security vulnerabilities in the hardware. With a single file, the security researchers managed to gain root access to the device through the built-in Device Firmware Upgrade (DFU) mode. 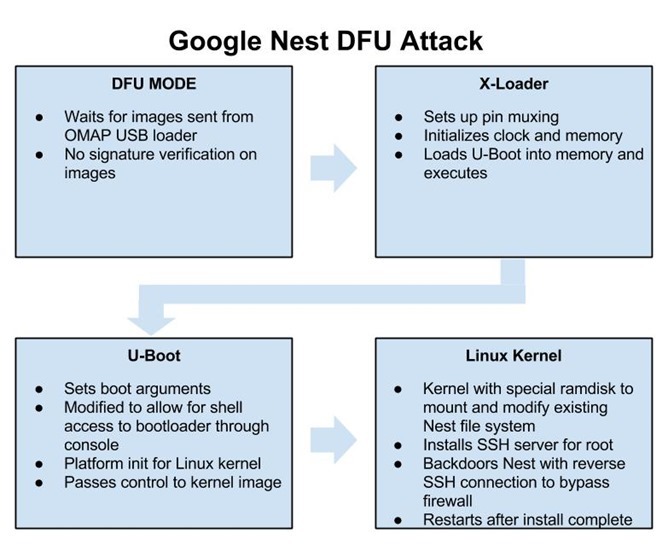 GTV Hacker's interest in gaining root privileges for the Nest are primarily in the name of security, because the device's automation features make it particularly disturbing to think of someone else gaining access. They'll be speaking about their work at DEF CON 22 in August. That being said, there should be some interesting things that developers can find to do with those root privileges. You can download the exploit and read the instructions at the link below. Finally, the official Nest Android app has been updated to version 4.2.0.21 to work with the new developer program. You can get it at the widget below. PALO ALTO, Calif.--(BUSINESS WIRE)--Nest Labs, Inc. (www.nest.com) today launched the Nest Developer Program, which makes it possible for Nest and the more than 5,000 developers who’ve expressed interest in the program to work together to create meaningful interactions among Nest products and others – both inside and outside of the home. More than just linking and remote controlling the devices in your home, the Nest Developer Program allows everything from lighting to appliances to fitness bands and even cars to securely connect with Nest products, bringing the conscious home to life by making those homes safer, more energy efficient, and more aware. And these are just the first of many Works with Nest experiences that will be possible with the Nest Developer Program. For more information and to learn about new Works with Nest products, visit www.nest.com/works-with-nest. Developers can submit their ideas at www.thoughtfulthingsfund.com. Nest believes in being open and honest about how we use customer data and we do everything we can to protect customer information. For authorization, we use the industry standard OAuth2.0. In addition, we require that our developers let users know what information they’re requesting and why they’re requesting it. That way, when users choose to authorize a connection between their Nest device and another product, they understand exactly what they’re authorizing and how it will benefit them. Nest limits the amount of data held by developers by not sending them personally identifiable information about users or permitting them to retain more than ten trailing days of data. Users can choose to disconnect an integration at anytime. If for any reason they decide to delete their Nest account, Nest will automatically disconnect any active integrations, as well as erase their personal information from Nest servers.